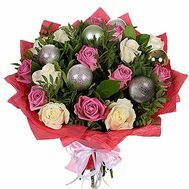 New Year's bouquet is an amazing kind of gift that can conquer someone's heart. 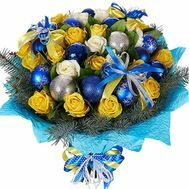 Extraordinary, special, it is imbued with a New Year's atmosphere and happiness. 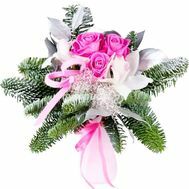 In addition, the relevance of flowers in the cold season significantly increases, because the beautiful, tender buds will bring that warmth, which is so lacking in the winter. 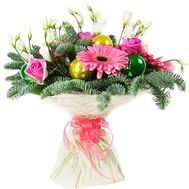 The most diverse, bright and modest, big and small, New Year's bouquets impress each recipient with their thoughtfulness and originality. 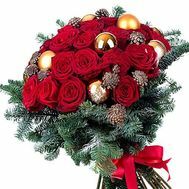 Presenting such a gift, you speak without words about how important a person is to you, how much you admire him and how much you wish him success in the new year. 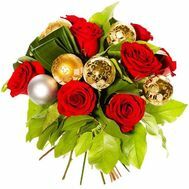 Than to surprise on New year? 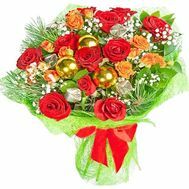 Flowers for the New Year - the most unexpected and original gift that you can imagine. 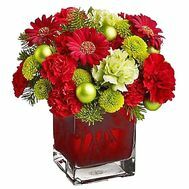 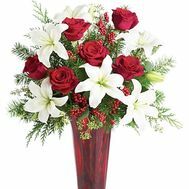 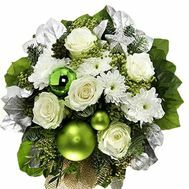 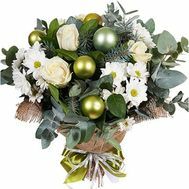 They will not only bring a great mood, but also give bright, unforgettable emotions and add floral freshness to the winter cold. 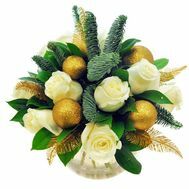 On the festive table, there is sometimes a lack of a beautiful and special accent, and it is this that can create fresh flowers. 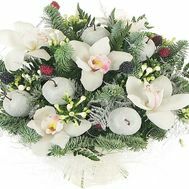 A bouquet for the New Year with spruce branches will decorate the festive table and add a persistent, coniferous aroma. 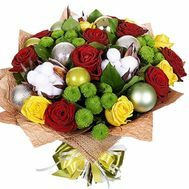 Each bouquet has a festive decoration and comes in a thematic package. 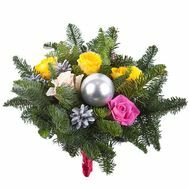 Also each of our gift has a special floral decoration: rain, New Year's toys and much more. 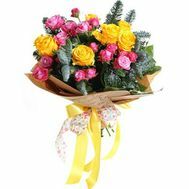 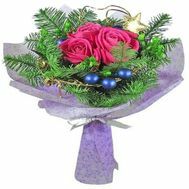 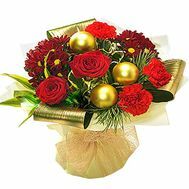 A New Year's bouquet of flowers with cones is a creative and stylish gift, which can be presented even to superiors at a corporate holiday. 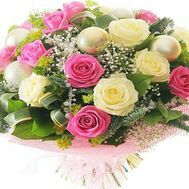 Especially for such occasions we give the opportunity to add a bottle of champagne to each bouquet in our shop, thereby making the holiday much more unforgettable. 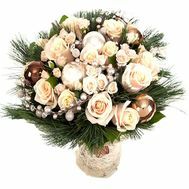 Where to buy a bouquet for the New Year? 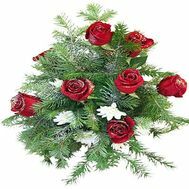 Our store has more than 10 years of experience in the field of services related to floristry. 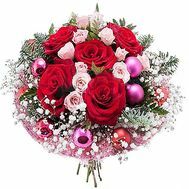 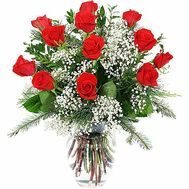 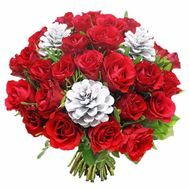 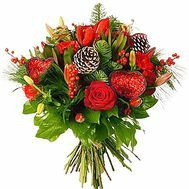 Our flower delivery service is deservedly considered to be the fastest and fastest in Ukraine. 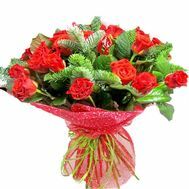 And our customers - the happiest and most satisfied among all. 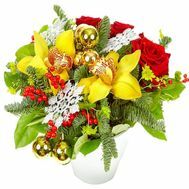 Have the opportunity to take part in promotions and get huge discounts! 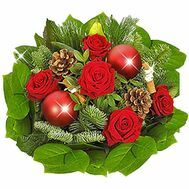 Looking for an original gift for the New Year? 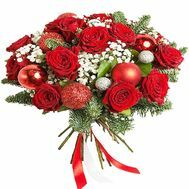 Then you have addressed to the address, and we can easily create a New Year mood for you and your loved ones!